Sun Peaks winery tours are new to the Kamloops and Sun Peaks area and are quickly gaining in popularity amongst casual wine drinkers as well as those with a more experienced palette. 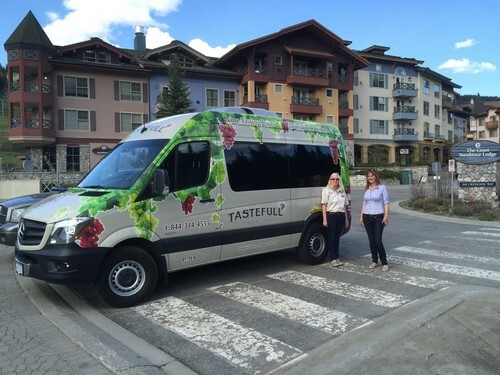 While there are no wineries at Sun Peaks Resort itself due to the elevation, we work with certified and experienced tour operators from Kamloops who can arrange to meet in Kamloops or even pick up and return guests right from your Sun Peaks accommodation during late spring to early fall. 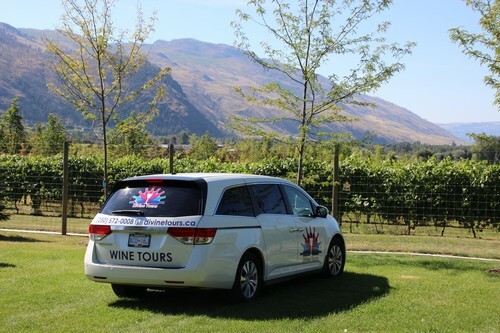 Even better, they can customize a tour to visit selected wineries, local waterfalls (there are two in the area) popular Kamloops brew pubs, a cider mill, and/or trendy café’s and restaurants. There are now also 5 different craft beer businesses in Kamloops that can be visited as well. You can also choose to compliment your day of wine tours by booking in-suite massages for your group or a custom, gourmet dinner prepared by the Red Seal chefs from Bottoms Sun Peaks Catering, all in the comfort of your accommodations at Sun Peaks. Or you can make it a full day of pampering and relaxing with a Sun Peaks Spa session after your tour. 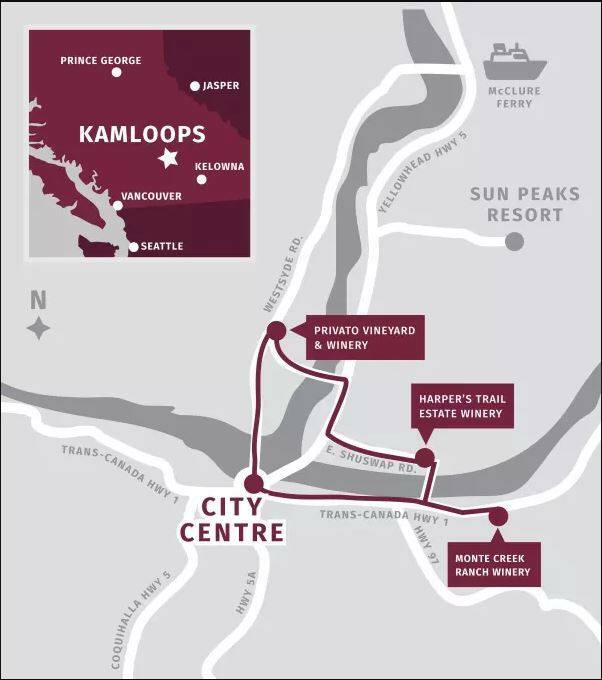 The Kamloops Wine Trail is the closest to Sun Peaks and the newest emerging wine producing region. There are currently four wineries to choose from (Privato, Harper’s Trail, Monte Creek Ranch Winery and Sagewood Winery) with more planned in the future. Between them, they have already won numerous awards and are certainly worth a visit as a Sun Peaks winery tour. 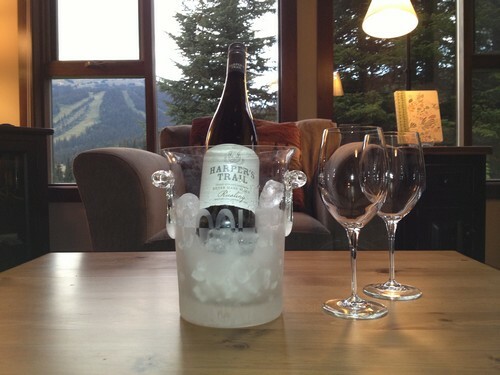 We love enjoying Sun Peaks area wines in our Best Sun Peaks condo or our Trapper's Landing townhouse when we are there! 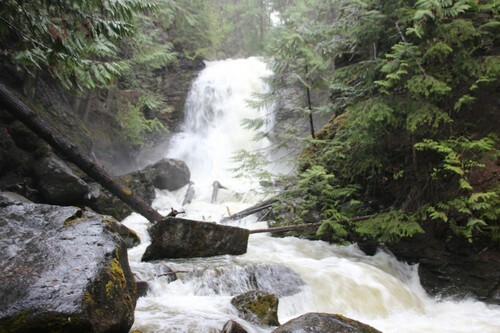 A post-wine tasting walk to the Whitecroft/Sun Peaks waterfall can be arranged too as part of a half or full-day winery tour. Full-day Sun Peaks winery tours can be arranged to experience the more well-known southern Okanagan area of West Side/Kelowna. Enjoy the rolling hills and scenic lake views along with some popular West Side wineries including a choice of Mission Hill, Quail’s Gate, Volcanic Hills, Beaumont, Rollingdale, Mount Boucherie, Little Straw or others. Another popular southern Okanagan wine region featuring beautiful vineyard and scenic water views, with selections from Thornhaven, Sumac Ridge, Sonora Estates, Dirty Laundry, Heaven’s Gate, 8th Generation, Silk Scarf and more (full day tours). Experience part of the Kamloops Wine Trail and beyond to enjoy more wines, beautiful scenery and perhaps another waterfall with a side-trip to Margaret Falls in Herald Provincial Park. Sample wines from a selection of Harper’s Trail, Monte Creek Ranch, Recline Ridge, Celista Estate or Sunnybrae. Experience more history and something different with a trip to the Gold Country Wine Trail, with stops at places such as the new wine tasting room at Fort Berens in Lillooet, the Left Field Cider Co. in Merritt, and the Bonaparte Fruit Winery in Cache Creek. 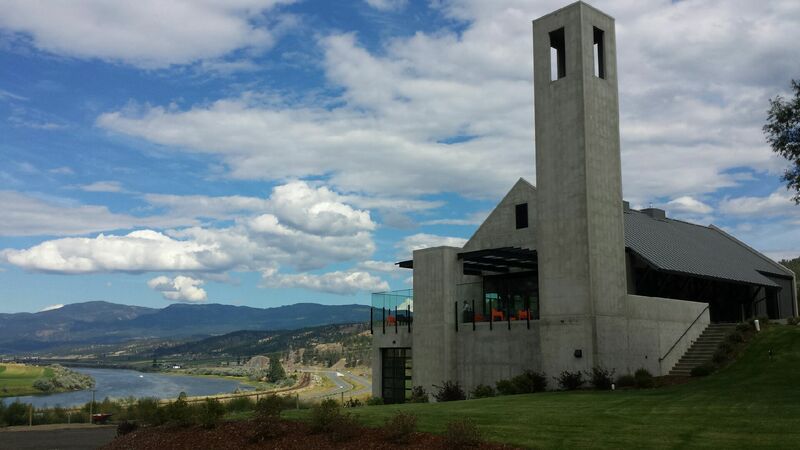 Full day trips to Okanagan Centre with potential stops at popular wineries such as Gray Monk, Intrigue, 50th parallel, Ex Nihilo and Arrowleaf Cellars. 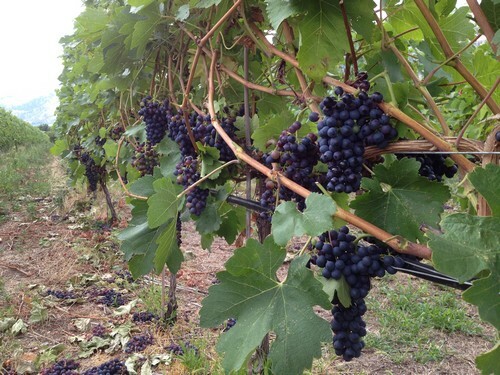 Learn more about the various British Columbia Wine Regions. 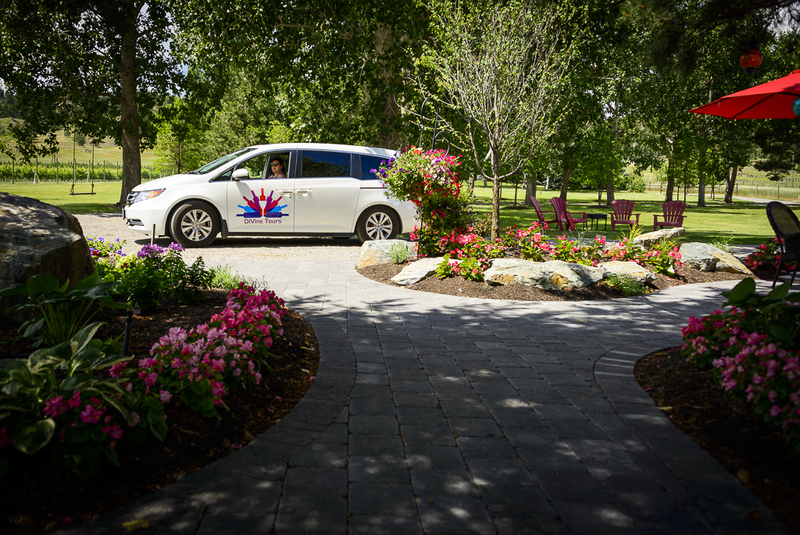 With a number of different size licensed vehicles and experienced winery tour operators, custom charters, tours, group services and Sun Peaks Winery or Sun Peaks craft beer visits can be arranged - great for group activities like stags, stagettes, birthday parties, family reunions and more. For more information about winery tours, craft beer tours, scenic tours, bus or van charters, complete the form below and one of our preferred operators will be in touch.